The O3b 1 - 12 satellites of Jersey, Channel Islands based O3b Networks Limited offer low latency Internet backhaul to emerging markets and developing countries worldwide at speeds up to 10 Gbps with a combined total capacity in excess of 160 Gbps. Thales Alenia Space started design activities under contract in 2007 and has received Authorization To Proceed (ATP) with the construction phase of the project. The delivery of the initial satellites and service activation are scheduled for late 2010. O3b Networks recently announced the new satellite network with support and funding from Google, Inc, Liberty Global, Inc., and HSBC Principal Investments. Bridging the gap between current satellites and fiber optic cables, O3b Networks will provide fiber-like trunking capacity to telecom operators and backhaul directly to 3G Cellular and WiMAX towers. The space vehicle is designed, integrated and tested, by Thales Alenia Space. Leveraging the heritage redundant service module design and manufactured utilizing an innovative island production approach. The unique payload system design enables flexibility of antenna usage and graceful degradation. The first eight space vehicles were planned be in orbit by 4th quarter, 2010, but were delayed to 2013. The Ka-Band payload is designed to enable the high speed flow of data between locations on the ground. Twelve fully steerable antennas ensure an optimized connection to the area where data is needed. The payload portion uses existing Ka-Band repeater technology to allow for straightforward allocation of the bandwidth anywhere within the 500 km diameter area on the ground which is illuminated. The flexible configuration of the satellite allows for inter-antenna data transfer in a variety of ways. Thus, trunking between two points is simple, or trunking between many points is also possible. The steerable antennas can be moved onto a location in minutes and each provide up to 1.25 Gbps of throughput. The service module provides platform three axis pointing stabilization. The 3-axis control is provided by a combination reaction wheels, torque rods and reaction engine assemblies. Attitude determination is provided by earth and fine sun sensors in conjunction with an inertial measurement unit. A GPS Navigation Unit provides orbit position. Power is supplied by two gallium arsenide solar arrays and a Li-Ion battery. 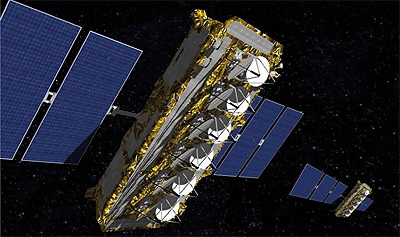 Thales Alenia Space announced in September 2008 it has started construction of eight of its Medium Earth Orbit communications satellites with options for additional spacecraft. In November 2011, a third batch of four more satellites was ordered to be launched in 2014. The satellites were originally to be launched on Zenit-3SL (2) boosters, but changed in 2009 to Soyuz-ST-B Fregat-MT boosters. The first launch in June 2013 orbited four satellites. Two of the satellites of this launch suffered some low-voltage events in their power supply, leading to a delay of the second launch into 2014. The second launch was conducted in July 2014 and the third followed in December 2014, bringing the constellation up to 12 satellites. O3b Neworks plans to order higher performance improved O3b spacecrafts in early 2015. Eight of these were ordered in December 2015, which are about to be launched from 2018 onwards.